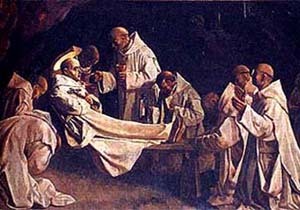 Although never formally canonised, Bruno's cult was approved for the Carthusians in 1514 and extended to the universal Church in 1623. 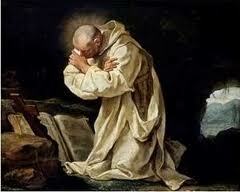 Summary of St St Bruno, Priest. Born in Cologne (Germany) about 1032; died in Calabria (Italy) on this day in 1101. Professor at the cathedral school of Rheims, appointed chancellor of the diocese who helped to reform the clergy. Founded the Carthusian order of hermits at Chartreuse near Grenoble. Called by his former pupil Urban II to assist in Rome for a time, he subsequently established a second Charterhouse in Calabria, noted for poverty, solitude, and penance. St Bruno began as an educator of the clergy and ended as the founder of the first Carthusian monastery in the Chartreuse valley near Grenoble in the year 1084. Philip Gröning’s recent film Into Great Silence throws the viewer into a direct experience of the silence, prayer and ritual of the monks of the Grande Chartreuse today. Patrick Duffy records the saint’s life. Bruno was born in Cologne, studied grammar and theology at Reims and Tours before being ordained a priest at Cologne in 1055. Then appointed lecturer at Reims, he trained many gifted leaders in the Church, including the future Pope Urban II (1088-99). Bishop Manasses, the archbishop of Reims, appointed him chancellor of his diocese. Bruno found his archbishop quite corrupt and though he tried to check him, never fully succeeded. 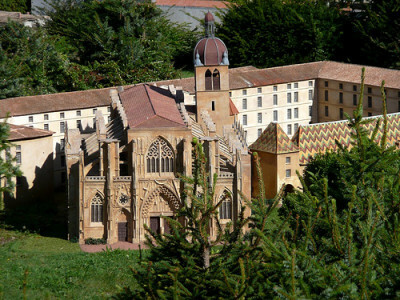 Bruno then decided to become a monk and for a while lived as a hermit under the direction of the monastic reformer, Robert of Molesmes, the founder of Cistercian abbey of Citeaux. After some time Bruno moved on to the diocese of Grenoble, where the bishop Hugh gave him a charter for a site in the wooded Grande Chartreuse valley. There he and his followers built an oratory and small cells, but the eremitical life – the life of a hermit in solitude, poverty, austerity – was central, The model was the desert fathers of Egypt and Palestine. Vespers and Matins and Lauds took place in the church: the other hours in solitude. There was Mass on Sundays and major feasts when the monks came together for a main meal. They wore hair shirts, ate no meat and fish only if it was given to them. They spent their day in prayer, reading and manual work. After six years Bruno’s former pupil, now Pope Urban II (1088-99), called him to Rome to advise him on the reform of the Church. For a time Bruno settled in Rome in a hermitage in the ruins of the baths of Diocletian. But when Urban became involved in a quarrel with the antipope Gilbert of Ravenna (Clement III), both he and Bruno had to flee to Calabria in the south of Italy. In Calabria, Bruno, after refusing the offer of the bishopric of Reggio, was able to found at La Torre a second monastery modelled on Chartreux, and five years later as the number of disciples increased, founded another, St Stephen’s. He kept in touch with the mother house by letter and through a visit to La Torre by the prior, Landuin. In 1984, German filmmaker Philip Gröning wrote to the Carthusian order for permission to make a documentary about them. They said they would get back to him. Sixteen years later, they were ready. Gröning spent six months living the life of a Carthusian monk and single-handed produced a stunningly elemental film throwing the viewer right into the daily tasks, prayers, rituals and rare outdoor excursions of the monks – without score, voiceover or archival footage. The film is called Into Great Silence.